I've been trying to wrap my head around New Zealand stouts. Some of them have been amazing and some of them have been real clangers. I even had my first ever un-finishable bottle of beer. I wept as I thought of the money I'd wasted on the grossest beer of my life. But onward to better things! I can't possibly go wrong with a Renaissance beer after all it was voted champion international small brewery at the Australian beer awards. 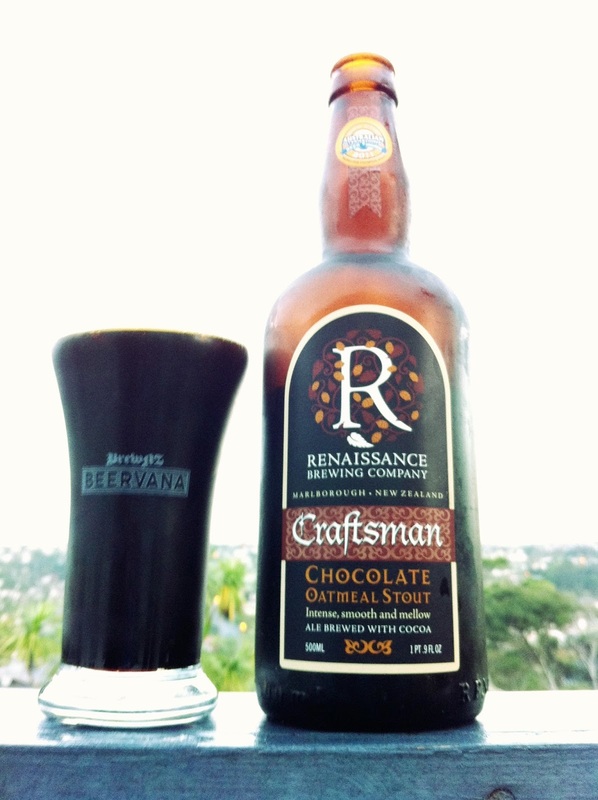 The Craftsman is a chocolate oatmeal stout, now the oats don't add a "porridge" flavour to beer however they break down to give the beer body and a smooth feel on the palate. As for the chocolate according to the label there's cocoa nibs a plenty used at different stages of the brewing process. All those nibs must be working because the aroma is divine. Its a milk chocolate, soft to begin but developing into a mocha dark coffee aroma as you linger over the glass. Once you drink it it turns into a dark chocolate and medium roast coffee experience with hints of burnt toffee. It's not a sweet stout, nor overly bitter, there's a nice maltyness that really comes out as the beer warms. However it's not as silky on the tongue as you might expect for an oatmeal stout, in fact it sometimes feels a bit thin, but there's plenty of complexity from the dark roasted malts and coca nibs interacting to make for a very moreish brew. The hops are subtle as you'd expect from a stout, but they let themselves be known on the finish which is slightly zingy on the sides of the tongue. Added bonus is of course the attractive distenctive Renaissance bottle which Dai Henwood described as "making you feel like you are in Game Of Thrones, not the suburban twenty tens". Too right. Perfect for a winters night, posible dessert match but also good with venison!